Features a unique pull back wind-up motor. This beautiful Spiral Race Car runs on a unique spiral wind-up motor. Pull back the spiral rod on the back of the car and the tin driver speeds away with a tin roar. 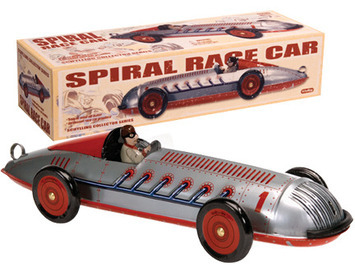 This Classic original Silver Edition is a reproduction of the famous Buffalo Spiral Car of the 1930's. Features a rubber bumper – saving the skirting boards. This model comes in it’s original box which is also in mint condition.